If you’re like me, you’re familiar with a life out of balance—a life of misplaced priorities. Some of us may spend too much time on entertainment, social media, exercising, our careers, or worrying about ourselves. The list is virtually unlimited. During the past five months, I have lost my balance (in a big way) due to medical concerns within my family. I have been spending a lot of time in medical/dental offices; the costs add up. I don’t think straight, and my mind won’t shut down. I usually have a hard time falling asleep and staying asleep. What are the Main Components of “Balance”? I’m sure that the answer to that can vary with the source. Frankly, I have seen many lists that define “balance”. Personally, I like preacher Joyce Meyer’s list; she says that the main aspects of balance are worship, work, rest, and play. I notice that I feel stressed and fatigued when I neglect one, or more, of these components; they are all necessary for a healthy life. Joyce Meyer compared re-prioritizing to changing the settings on a DVR (digital video recorder). If we aren’t as interested in a certain show as we were before, we can move that program further down on our list of shows to record—or, delete it from the lineup completely. That way, other shows will take precedence over it. That production will no longer be our top priority. This analogy relates to our minds in the following way: if we are devoting too much time and attention to a certain activity, or thought, we can “change the settings” in order to diminish our focus on it. Mary and Martha are sisters mentioned in the tenth chapter of Luke. Jesus is invited into their house. The two ladies had no time to prepare for the visit of such a glorious personage. As a result, Martha is anxiously occupied with cleaning and cooking. After all, a good host wants everything to be perfect for her guests, right? Martha also wanted Mary to help her do chores. 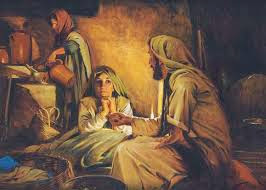 In fact, she asked Jesus why he didn’t insist that Mary help her; she felt overwhelmed. How often do you rethink your priorities? Great analogy, Traci :) I totally agree that balance is necessary to keep the fleshly organism/spiritual self healthy and constantly adjusting the settings is the key to getting there! Hi, Suzan! I sincerely thank you for your comments! I loved the analogy so much that I had to use it! Joyce Meyer is so practical, yet inspirational, in her speech. She helps me to see how we all need to be constantly aware of any adjustments that need to be made. I agree with what you have written. The only thing I would add is the wisdom to ask for help to re program. Hi, Suzi. Thanks so much for reading! You're absolutely right to say that we often need help to re-program our minds and/or bodies.Thanks for your continuing wisdom and support!